This is now the sixth disc in the project to record all of the works of Machaut in the light of the recent publication of editions by Yolanda Plumley and R. Barton Palmer. Each CD has been recorded by the busy Orlando Consort. The chosen booklet illustration is of a distressed bedridden individual being attended to by a sympathetic doctor - presumably the ‘gentle physician’. 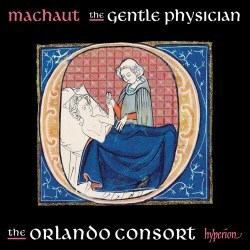 In Machaut, though, the allegory is that the patient is the lover whose love is unrequited and the physician is, mostly, the lady who can heal his wounds. The other interpretation, highlighted here, is that it is ill fortune that has created the patient and he/she can only be redeemed by hope. We know a great deal about Machaut, a canon at Rheims Cathedral, because he left us his autobiography in ‘Voir Dit’ (c1365) and his long narrative poem ‘La Remède de Fortune’ (c.1350). He also had his complete works (one assumes) copied into luxurious manuscripts. Not only music, but his own poetry too, in which is tells us that, at an age probably in his early fifties, he fell in love with the nineteen-year-old Péronne d’Armentières. He wrote letters and poetry to her and set some to music, which he also sent her, sometimes qualifying its unusual character or explaining its background. The latter of these works is a long rambling love story in which the poet manages to give examples of the principal types of lyric song he composed, that is Lay, Ballade, Rondeau and Virelai. There are also occasional motets. The Orlando Consort on each of these discs has set out to offer examples of all these forms. The opening De fortune is given in its three-part version, but the last track offers us a four-part version of one of the verses, made, it seems, by a Machaut pupil. It is much richer and I think works well. I felt a further verse would have added extra interest and insight. However, Jacques Boogart in his excellent notes fears that it might obscure too much Machaut’s original. Its text, though, sets the scene for the whole CD. So in verse 3 we hear ‘For fortune, who is never stable, /Will turn her wheel to my disadvantage”. To illustrate this, we can go to one of the pieces which especially stands out - the Lay de Confort: S’onques dolereusement, which is most extraordinary. There are nineteen lays by Machaut and many are quite extensive, as you can see above. It is also a compositional as well as a poetic tour de force. The stanzas are divided into a symmetrical pattern. Each verse is a double stanza and the outer sections, stanzas 1-5 and 9-12, are in compound duple time. The inner ones are in simple triple time and it is not till this point that we realise that it is the lady who is speaking and not Machaut. Furthermore, each is a three-part canon at the octave so Machaut has constructed twelve different canons. In addition, Machaut “plays with a different pair of end-rhyme sounds” (Boogart). The idea “seems to be to evoke the eternal rotation of Fortune’s wheel”. I haven’t yet ventured into the performances. The Oralndos sing this lay with much gusto, delight and a superb use of diction. For contrast, the melancholy Ballade, Dame, comment qu’amez is, I feel, very beautiful and is beautifully performed by Matthew Venner and Agnus Smith. The complex textures and hoquets of the motet Maugré mon cuer are extremely clearly elucidated. But other performances do not always connect with me. There are, for example, two Virelais. These are, as Boogart admits, dance songs and some performances that you hear give the music a strong rhythmic quality, even using percussion. These are monophonic pieces. The examples here, especially De bonté, de valour, as in the hands of Mark Dobell, do not capture that charm and have become rather pedestrian. In other pieces, I feel that the Orlando have not considered dynamic contrast sufficiently to add interest and not tire the ear. You wouldn’t, for example, play this CD right through without a stop I think, and the tempi can be rather hard-driven. Surely each of these musical ‘formes fixes’ needs to approached a little differently. Not only on this disc, but on the others, which I have reviewed or possess, I feel this is a facet of the music which has been overlooked. But how can this be done with the same group of male voices? In fact, I have come back to thinking that, if the idea of a complete Machaut edition came from Hyperion, then it might have been more interesting and informative for all concerned if different groups or singers had been involved. As good as the Orlando Consort often are, there is a sameness about these recordings which is beginning to pall. So I’m sorry that I can’t give this new CD a clean bill of health, as it were. I know others will praise it and I know that to have all of Machaut eventually, no doubt available in a huge box set, will be a considerable achievement. But I need more variety when listening to 14th Century music and I am not finding that the Orlando Consort are able to offer it.